For several years I’ve been an occasional whisky-tasting attendee. These events are usually pompous single malt promotions with a bit of exclusivity to taste something unique that I may not buy myself. Last night’s Glen Moray tasting was quite different. The label’s master distiller, Graham Coull, presented his finest whiskys for us to taste. Perhaps due to the format it was a larger crowd than we’re used to. It was also the biggest audience the distiller had ever been part of. 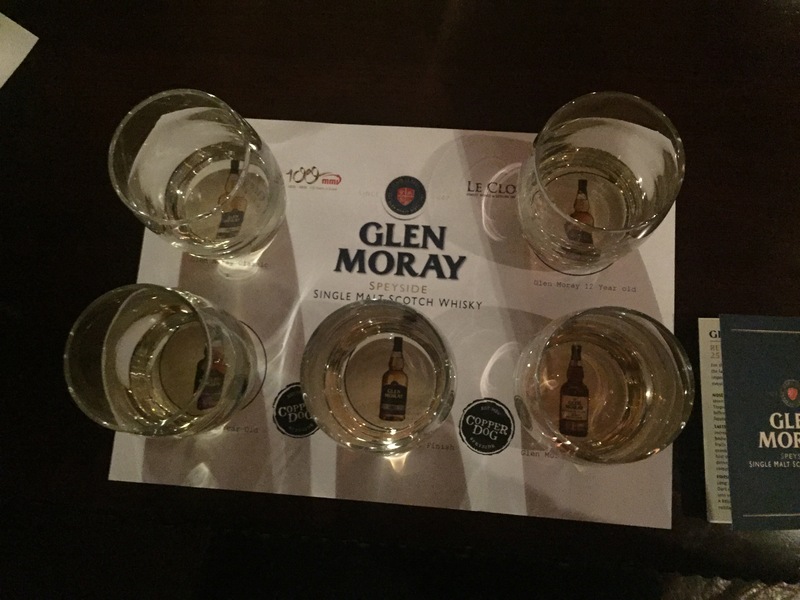 And this was after having a promotional tour of Australia – Glen Moray’s 3rd largest market. The Hilton Double Tree’s COPPERDOG was a superb bar to host this. It overlooked the amazing Ain Dubai (“Dubai Eye”) which seems to have almost 75% of the wheel completed. Building a massive pie chart is such a handy shape to report upon progress. Rather than a speech and stories, Graham patiently took endless questions from the many curious folks. Most were pretty standard stuff which I think I could answer after a dram or two. There are always questions like the exchange of whisky, and blends. Fun fact: Glen Moray might be the best thing in Johnnie Walker Red – even the only good thing in Johnnie Walker, depending on your tastes! Then a guest asked Graham where the bathroom was. But my highlight was someone asking if after opening a bottle of whisky, is it recommended to finish it on the same day. I can’t recall his detailed explanation, but what I chose to hear was Yes. Out of the five samples, the 25 year old was clearly the smoothest. But we were taken on a real Speyside journey from the Classic, to the 12 year, to the 15 (inferior to the 12 in some eyes), to the port casks and the sherry cask. The 12 year old was finished in a bourbon cask, Jack Daniels to be precise if you could believe the perceptive guy next to us – which I didn’t. It’s an interesting story how whisky has become so dependent on the casks of other spirits to finish and improve their flavour. And other spirits aren’t keeping up with this demand. This has led to some whisky companies going into the sherry business not for the content but the container. Glen Moray generally use their casks twice or three times. Graham explained he sees casks similar to tea bags. Their first use is a bit strong, the second is fine, but the third can be a little too weak. Being a proud Scotsman, he said it’s only natural they get maximum use out of everything. The five of us were in a booth that had places set for seven. Handy. We thought to get maximum use out of things also and devoured the extra whisky samples. We spotted another three untaken places at nearby table. A guy was one step ahead of us about to help himself to one or two glasses when the lady at the other side of the table snapped at him. It was quite funny to see her fury, and the gentleman deflate away. She scooped up the glasses into her chest like a protective dragon cuddling her eggs. The next morning was the concluding chapter. Still quite seedy, I taxied back to the venue to pick up my car. I couldn’t tell if the attendant was joking when he asked if I had forgotten my car.